Stop paying for foods loaded with toxins, unhealthy fats and sugars, brand name advertising, expensive eco-unfriendly wasteful packaging and expensive store mark-ups and make your own high quality mixes and ready-to-go products at home for a fraction of the cost! Quick-Fix Healthy Mix contains over 150 dry and liquid mix recipes to stock your kitchen using easy-to-find basic ingredient, allowing you to choose how much and what types of sugar, fat and flour goes into your finished food. With recipes for breakfast foods, baking mixes, condiments, dairy products, seasoning mixes, rubs, sauces and syrups, soups, rice and pasta mixes, salad dressings, peanut butter, marshmallows, beverages and so much more, you can enjoy the things you love without the worry!. And you?ll learn how to make your own fruit leathers and jerky. Servin’ Surprises Cook ‘n Serve Kitchen and Table Set is an interactive play center that brings Role Play to life in a magical way! Place any Servin’ Suprises food item on the magical serving tray & it recognizes that specific food & responds with related sound effects and sung songs! 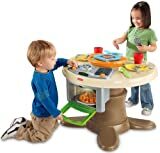 Table features built-in stovetop with burner & grill and open-and-close light-up oven, all featuring realistic sound effects. Includes 4-slice pizza with customizable toppings and pizza cutter. Place the pizza on the serving tray to hear fun pizza sound effects and a great pizza song! For dessert, there are 4 cookies with ready to bake on a cookie tray. Also includes two place-settings for sharing your creations, each with pretend fork, spoon, cup and plate. When you’re done preparing and sharing your meals, the fun is just getting started — the oven easily slides off and the stovetop flips over to convert into an activity table that is perfect for arts & crafts, snack time or any other activity. Storage area in center of table holds place settings, utensils and food accessories. The Fisher-Price Servin’ Surprises Kitchen & Table is full of surprises for kids–like a “magic” tray that recognizes the food being served with songs & different phrases like “Who wants pizza?” or “Mmmm, cookies!” There are songs to teach kids about manners and cleanup too! Plus a stovetop with a burner that makes cooking sounds and an oven with light and timer sounds. When you flip over the stovetop and remove the oven–surprise! It becomes an activity table! Place settings and food pieces store right inside table. “Magic” tray recognizes the food being served with songs and different phrases. View larger. 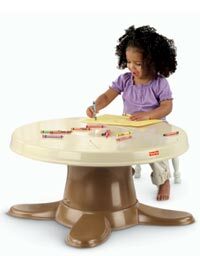 Easily converts to an activity table. View larger. The Play Kids Are Hungry For! 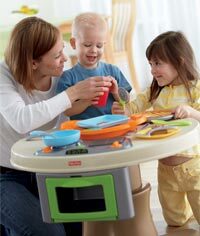 With the Fisher-Price Servin’ Surprises Kitchen & Table, kids can make, serve, share, pretend, sing and more–like never before! The “magic” serving tray brings role play to life for kids when it recognizes the food they’re serving with songs and different phrases such as “Who wants pizza?” or “Mmmm, cookies!” There are even songs about manners and cleanup! The table includes four slices of pizza with toppings and pizza cutter, cookies with cookie sheet, and place settings for two, so kids can serve up what they’ve prepared to parents or friends! Enjoy fun phrases and songs about food, manners and cleanup. View larger. What Do We Learn from Preschoolers? Want to Add More to the Menu? Bring other items to the Fisher-Price Servin’ Surprises Kitchen & Table, like the Fisher-Price Servin’ Surprises Birthday Party Set, Tea Party Set, Barbecue Set, High Chair Set, and Ice Cream Party Set (sold separately) and place them on the “magic” serving tray for more songs, more phrases, and more delicious fun! 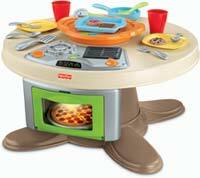 Table with convertible stovetop, removable oven, serving tray, four slices of pizza with toppings, pizza cutter, four cookies, cookie sheet, two forks, two spoons, two cups, two plates, and six AA batteries. Cambria’s Kitchen: Healthy Cheese Pizza! A prerequisite for every kitchen veteran or aspiring home cook, this comprehensive reference answers virtually every kitchen query and speaks to every culinary concern and condition. For example, how do professional chefs get more juice from a lemon? They simply heat it in a microwave for 10 seconds and roll it on a work surface before cutting and squeezing it. Is wrestling with a pastry cutter frustrating? Pastry chefs grate cold butter with the large holes of a box grater for their dough. Shortcuts, embellishments, restaurant tricks, presentation tips, party planning and recipe development. Whether they are just browsing or desperately trying to solve a vexing emergency, every home cook will treasure 12,167 Kitchen and Cooking Secrets. Turkey wraps 1½ tablespoons of light cream cheese or garden vegetable cream cheese 1 wrap-size flour tortilla (Spinach or sun-dried tomato) 2 lettuce leaves 2 or 3 slices honey smoked turkey breast 1/3 cup shredded carrots Spread the veggie cream cheese over entire surface of tortilla. (Green spinach or red sun-dried tomato tortillas add color). Place two slices of turkey on half of tortilla. Top with lettuce and shredded carrots. Roll the tortillas starting at the edge where you placed the turkey. Use a serrated knife to cut roll into 1-to 2-inch slices. Arrange on a plate to serve. Strawberry banana parfait 4 to 5 strawberries ½ banana 4 tablespoons light vanilla yogurt 1 tablespoon granola Cut up the strawberries and bananas. Drop them over the yogurt and sprinkle with granola. Serve.